Make Your Mark, Brick By Brick. Join us at the Dedication Ceremony to celebrate our Centennial Walkway opening on October 24th from 5-7pm. Order your brick today to become a permanent, visible part of its history and landscape. To celebrate our 100th anniversary, Mystic Museum of Art is selling customized inscribed bricks for a paved, 1000 square foot riverfront walkway as a permanent monument to mark the historic occasion. 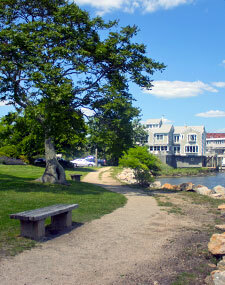 The new walkway will be frequented year-round by Mystic residents and visitors alike.